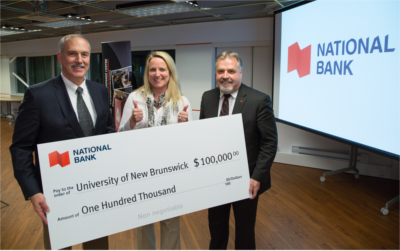 National Bank is partnering with the Pond-Deshpande Centre at the University of New Brunswick to support programming for the next generation of entrepreneurs. 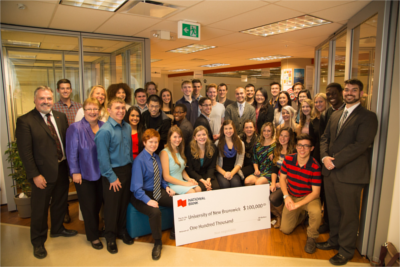 Through a generous donation of $100,000, National Bank is providing funds for the Technology Innovation Funding Program and the Student Ambassador Program at the Pond–Deshpande Centre (PDC). The announcement took place Tuesday in Fredericton during an introduction of the 2014-15 PDC Student Ambassadors. This year’s cohort will take part in a documentary produced by Hemmings House, which will follow these passionate, action-oriented students from universities across the province as they learn about and champion an entrepreneurial culture in Atlantic Canada. Technology Innovation Funding provides seed capital paired with mentorship to early stage innovators in order to assist with idea and market validation, the development of business models, raising capital and preparation for market launch. “With a combination of ideas, skills and passion, we can support development of tomorrow’s economic leaders with investments and mentorship,” said Karina LeBlanc, executive director for the Pond-Deshpande Centre. Programs at the Pond-Deshpande Centre assist emerging entrepreneurs and innovators whose social and tech business ideas potentially have high impact on the community. The centre was founded in 2011 by Dr. Gururaj “Desh” Deshpande (MSE EE ’75, DSc ‘01), president and chairman of Sparta Group LLC, Jaishree Deshpande, treasurer of Sparta Group LLC, and Dr. Gerry Pond (BA ’66, DLitt ‘04), chairman of Mariner Partners who brings over 40 years of in-depth experience in the information and communications technology. “The University is extremely pleased with the development of the Pond-Deshpande Centre, and of the major role it plays in establishing and perpetuating a truly unique experiential learning opportunity for our students,” said Dr. Anthony Secco, UNB vice-president academic in Fredericton. The University of New Brunswick (UNB) is one of Canada's oldest English-language universities and one of the first public universities established in North America. Founded in 1785, the multi-campus institution is home to over 60 research centres and institutes, groups and ongoing projects. The university offers over 75 undergraduate and graduate programs in 100 disciplines. UNB has over 10,500 students from more than 100 countries, and several thousand more take UNB courses online and at partner institutions around the world.